A few weeks ago, I wrote about our first day of an intermittent fast, a day when we consume no more than a whopping 500 kcal. That first day was incredibly tough, compounded by the fact that all I could do was daydream about a bacon-blue cheese burger and crisp golden fries. I was also incapable of stringing together any sort of coherent thought by about 13.30 in the afternoon. Today is my fifth ‘fasting’ day, and it is easier than that first day. I’m learning how to spread out my caloric intake as much as possible throughout the day. And, know that getting the important thinking work sorted first thing. I still get irritable as the day wears on. But, it is easier. That said, it’s a bit annoying that once again today I find myself thinking of food I cannot enjoy. Each fasting day, I have been fixated on a particular food. The cheeseburger to top all others on the first day; another day, it was pancakes and mountains of bacon; and today, it is a moist, succulent and thoroughly huge pulled pork BBQ sandwich. I’ve had one such sandwich in the last 10 years or so, and the taste of that lovely bit of divinity is all I can think about now. Something tells me today will be particularly tortuous. Still, we’re both enjoying this experience. For me, I’m loving the challenge of cooking extremely low-calorie meals which are tasty as well as filling. I had no idea how large a plate of boiled broccoli it was possible to eat without breaking the 50-kcal mark. And, I LOVE broccoli. I thought I ate plenty of fruits before we started this diet; now, I eat at least twice if not three times as much as a month ago. For my husband, he has a thoroughly different reaction to restricting his intake. Instead of losing his ability to focus mentality on much of anything and becoming sluggish, he is like the energiser bunny. He bounds about the house a mile a minute and his mental acuity astounds me. The two of us together are hilarious—the yin and yang of fasting effects. Our schedules are still a bit wonky as we work out how to go about fasting and living normally. For instance, any normal exercise schedule had gone completely out the window for the first two weeks of our intermittent fast. We’ve tried to schedule our fasts for days when we have no social obligations. This week, things are normalising, which is a relief. A big test for me will come Saturday when I meet up with a few girlfriends for a charity handicrafts event. We’ve also had some fairly lovely results this far. Despite a bit of overindulgence on non-fasting days and not getting in my daily runs, in the first two weeks, I managed to shed a healthy 500 g. That may not seem like much, but after several months of running 5-km or more several times a week, I scarcely dropped any weight at all. On top of that, when I resumed running yesterday, I had a great run. The best since completely my first 10 k ever. So, the suffering as much as it is diminishing is paying dividends. 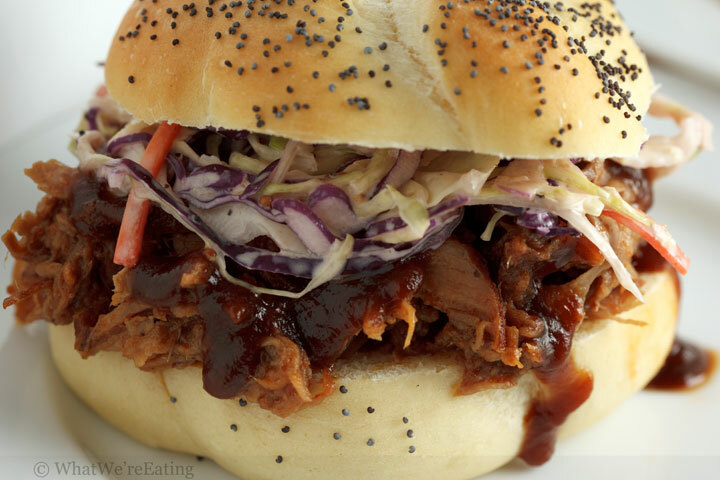 That said, today, as I sip my tea and eat many pieces of fruit, I will still dream of pulled pork and the hickory goodness of a fine BBQ sauce all delivered in a most fluffy bun with all the trimmings. No pain, no gain, eh? I cannot get this image out of my head and can just about taste it. Should you need a recipe, check out this one.